Prelude. So I started this post for Day 13 last night, but I got sucked into Dancing with Stars despite my efforts to resist it. Then, we rushed to the hospital to see my father-in-law who had complications after surgery. (Pray for him?) Now I am catching up on my #write31days challenge. Today I am discussing gift-giving and how this has changed for me over the years. I have simplified my process, and in doing that it actually creates less stress and brings me MORE joy. Gift giving is something I have always loved, but I’ve gotten really excited about it over the past couple of years. I love that it’s now less of a stressor and more of a blessing, all because of the way I approach it. All year long, I keep a list of potential gift ideas for family and friends. If I come across a really great product or idea that I love I’ll jot it in my Notebook for later reference. If I’m able, I go ahead and purchase it so I’m prepared when the right occasion rolls around. I keep recycled bags, of course. Duh. Who doesn’t. But every so often I also swing through the party aisle in…where else….Target and look for clearance gift supplies. I try to avoid “themed” bags and go with neutral ones instead so I have a more versatile collection to grab from. Another good idea is to keep an eye out for cheap boxes and baskets that may not necessarily be labeled for “gift giving.” I’ve found some great ones at Kirklands and Hobby Lobby. Just remember to keep this supply stash simple and don’t go overboard. You do not need to hoard gift wrapping supplies. Have you ever been really proud of yourself for buying a gift in advance, until you can’t find where you stashed it? Super annoying, right? That’s why I started keeping everything in one place. I also plan to create an ongoing list for the bin so I’ll know what’s I have without having to rummage through it. I’ve found that buying as I go is far less stressful than waiting until right before someone’s birthday, or spending hours and hours shopping leading up to Christmastime. – When you buy something for yourself or your home that would make a great gift, go ahead and pick up extras to save for later. – If you see something that immediately brings a certain friend or family member to mind, go ahead and buy it to store away for later. A good rule of thumb is to shop for the person rather than the occasion, that way you’re always keeping an eye out. – Shop clearance racks. I always check out the clearance sections in three specific stores: Target, Anthropologie, and Babies R Us. You never know what you might come across that would be a great housewarming or baby shower gift. – Shop online! When you first receive a party invite, jump online and head to Amazon. They have everything and shipping is quick. – Sign up for a subscription box. You’ll receive several different items monthly that you can put away for gifting later. A great option for this is Fair Trade Friday or their Earring of the Month Club. – Books! Books! Books! There is a book for everyone on your gift list. Home design, recipes, memoirs, how to’s, coloring books, educational books, inspirational books. – Coffee + and coffee related items. I don’t think you can have too much/too many. – Fair trade items – jewelry, shirts, bags. Check out Noonday or 31 Bits. – A hand written letter of your favorite memories with that person. – A small daily calendar with notes written in it. I did this years ago for my grandmother and she still has it. I wrote notes on significant days and then just randomly throughout for her to find as the year went on. – Tickets to an Experience (i.e., a photography or cooking class, concert tickets, a zoo pass, plays, comedy shows). – Kitchen items: stackable mugs, a nice serving bowl, Anthropologie latte bowls, or really pretty hand towels. – A magazine subscription because they have them for every interest under the sun. – A special gift certificate to create a custom item, like to Better Life Bags. Challenge: create your own favorite gift list, as well as a place to store items you buy in advance. 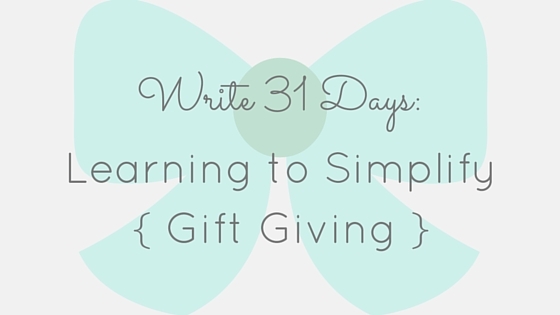 I promise you will be amazed at how much simpler and more enjoyable the gift-giving process can be. Also, if you have any go-to gifts, please let me know in the comments!